High-density rack-mount (HDRM) servers are emerging as one of the strongest segments in the entry-level server space. Their thin, rack-mount design saves space and simplifies the installation, operation, and maintenance of co-located systems. For dependable, manageable rack-mount servers, be sure to use Intel� server building blocks, including the new Intel� Servers. The Intel Servers accommodate up to two Intel� Pentium� processors with 512-KB L2 cache, providing powerful performance for demanding server workloads. Two independent 64bit/66-MHz buses, one independent 32-bit/33-MHz bus, and a Triple Peer PCI architecture enable high, balanced I/O throughput. Six DIMM sites allow for up to 6 GB of ECC SDRAM for memory-intensive applications. All component locations and design are thermally optimized for 1U and 2U rack systems. 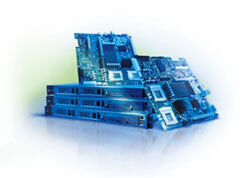 The Intel Servers deliver outstanding reliability for high-density solutions.